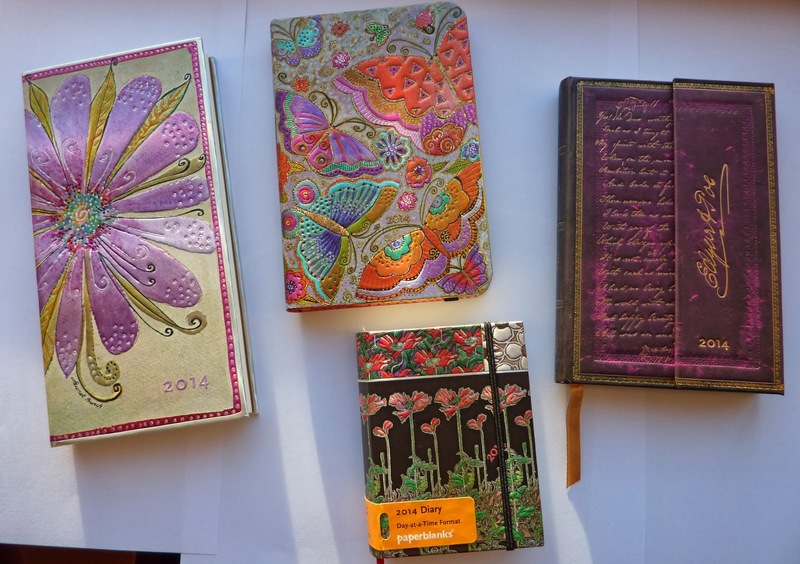 This is my second post on the new covers in the 2014 Paperblanks planners lineup. See my post yesterday for my review of the gorgeous Grande Filigree Floral Ivory and Maxi French Ornate Bleu weekly planners. Check out today's planners! Aren't they beautiful??? Because this post is already so photo-heavy, I won't show all the features and info pages of each planner. I showed representatives of pages like the international holidays etc. in my post yesterday, so you can go there to see features that all the planners have. I will show you details of anything that is different in these planners. Please note these planners do not have notes pages in the back, which is different from the larger planners I reviewed yesterday. I'll show you this one first. The Micro planners are tiny, measuring only 2 3/4 by 3 3/8 inches. But despite being so small they are very functional! At the back of the book there are monthly calendars for the future year. There is no address booklet, but there is a pocket and an elastic strap closure. This tiny book literally fits in the palm of my hand! It can easily go in any pocket. My son grabbed this cool little book! I love the rich purple color of this planner! You might remember I bought the 2013 Ultra size version of this planner to use as a notebook, which I wrote about here. At the back of the book there is a pocket with an address booklet. Here is the Flutterbyes Mini weekly planner, wow the cover is so beautiful!! It has a back pocket and address booklet which has several blank perforated pages in the back, and an elastic strap closure if you want to use it. The Slim planners measure 3 3/4 by 7 inches, so they are proportionally taller and narrower than the others, giving a nice large page size in a slim and portable book. The weekly pages have a horizontal layout with space at the bottom right page for notes, and there are two ribbon placemarkers. There is a forward planner at the back of the book as well as all the information pages I showed details of in yesterday's post. At the back of the book there is a pocket and address booklet, the last few pages of which are blank and perforated to tear out if you need a free piece of paper. There is also an elastic closure strap if you want to use it. 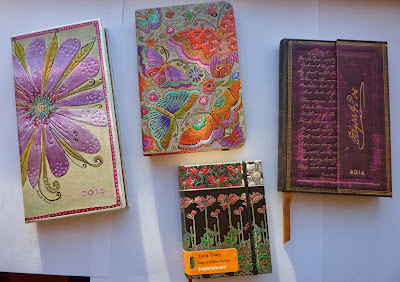 I grabbed the Flutterbyes and Florescence planners before anyone else in my family could claim them! I will use them as notebooks instead of planners, since I am now using a notebook for daily records and my extensive lists. These gorgeous little books will go everywhere with me in my bag, and their beautiful covers and wonderful paper will make them a joy to use! Between today's post and yesterday's, you have seen a sampling of the gorgeous Paperblanks 2014 planners which offer a selection of daily and weekly layouts in sizes from Micro to Grande and everything in between! Huge enormous thanks to Paperblanks for sending me these beautiful planners to review! You can find Paperblanks online at Paperblanks.com where you can see their entire selection of products and find stores near you. I LURVE the way they do the months horizontally--smart way to maximize space! Can you explain more about how you use the planner as a notebook? I have quite a few that I have not thrown away. Do you use them as lists or just spare paper to write down things on? I would use these the same way, just ignoring the dates on the pages.